After a busy weekend of holiday shopping, I am officially ready to start celebrating with family and friends. I still have plenty of gifts to wrap and label, but the heavy lifting shopping is over... thankfully! Between office holiday parties, family soirees, and New Year's Eve celebrations, there's plenty of opportunities to dress festive and full of holiday cheer. These gold Party Pants from Pink Slate add the perfect touch of glamour to any outfit. I was so excited when I saw that these pants were available on their site. I've been dying to get a pair to wear over the holidays. They are super comfortable, and in my opinion they add the perfect amount of sparkle ;). 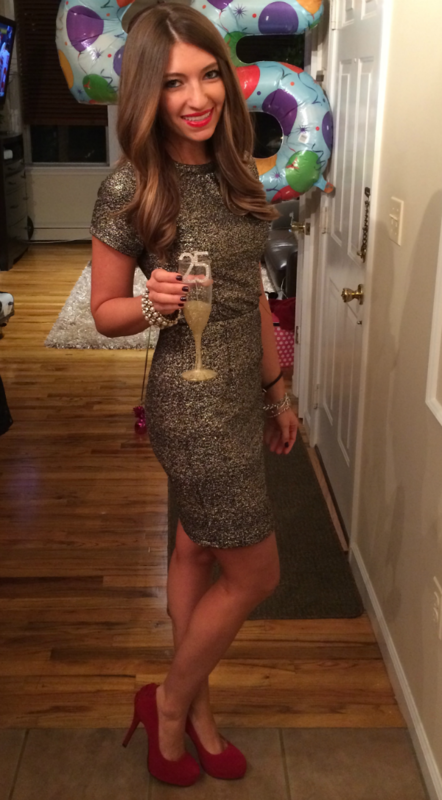 It's not essential to wear sequins or a bold sparkly outfit to a holiday party. It's not for everyone, I get it. Which is why I paired these leggings with a festive "thankful" t-shirt to show you that sometimes, it's the cool little details that make an outfit flattering for the holidays. To finish off the outfit, I added a stack of chunky bracelets. Never underestimate the power of an #armparty during the holidays. It's the first thing people notice when you are holding your glass of champagne or wine. The holiday season is the busiest time of the year, but don't forget to kick back and enjoy the special moments with your family and loved ones. Don't be afraid to bust out your favorite sparkly holiday dress (or in this case pants) and feel your brightest- literally! What are you planning to wear to your parties this year? Photography by Art Petrosemolo Location: Molly Pitcher Inn I want to give a special shout out to my colleague Art for helping with these photos, and a very big thank you to the Molly Pitcher in Red Bank for letting us use your beautiful venue for this shoot. Today is my birthday and I am spending it doing all of the simple things I love in life. I wanted to take this time to sincerely thank all of my readers, friends, and family. All of your sweet comments and support have truly motivated me to continue on this blog journey. This year has been full of excitement which was in part due to the birth of this blog. It has allowed me to personally express my passion for style and to connect with beautiful women and men from all over the world that find the same joy in fashion as me. I chose to share some more photos from my Paris trip for this blog post because it was one of the most special moments in my life so far...I got engaged! Although this happened two months ago, I'm still trying to digest the fact that I will be marrying my best friend and dream man. It sounds cheesy, but it's true. He makes me laugh unlike any person on this earth. His smile warms my heart and we stick with each other through the happiest times and the absolute worst times. I'm excited to begin this next chapter of my life and share these special moments with all of you. Thank YOU from the bottom of my heart for believing in me and following along on this journey. Although this time of year is focused around shopping and giving gifts to family and friends, it's also a time to get all glammed up for parties and family gatherings. If there's one time of year to experiment with your hairstyle...it's the holidays!! There are plenty of elegant styles that you can try at home without having to spend a fortune at the salon. One of my favorite looks is a loose, tucked bun. 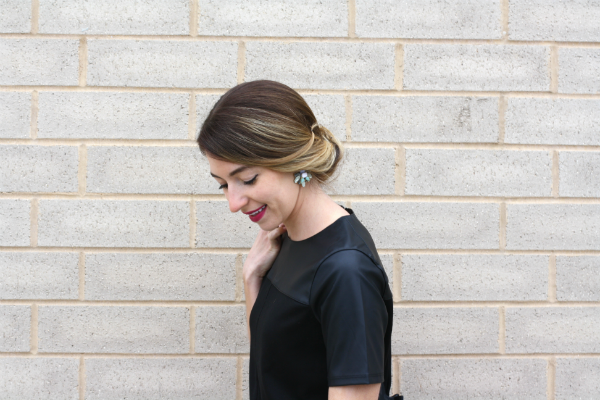 It creates the perfect canvas to add statement earrings, like these mixed stone earrings from Dorothy Perkins. 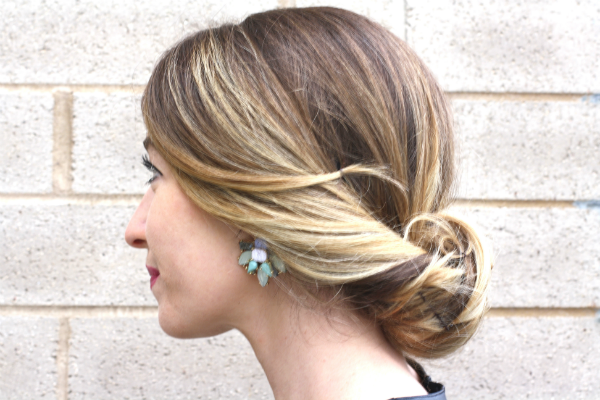 This un-done hairstyle is a little tricky to secure if you have layers (like me). 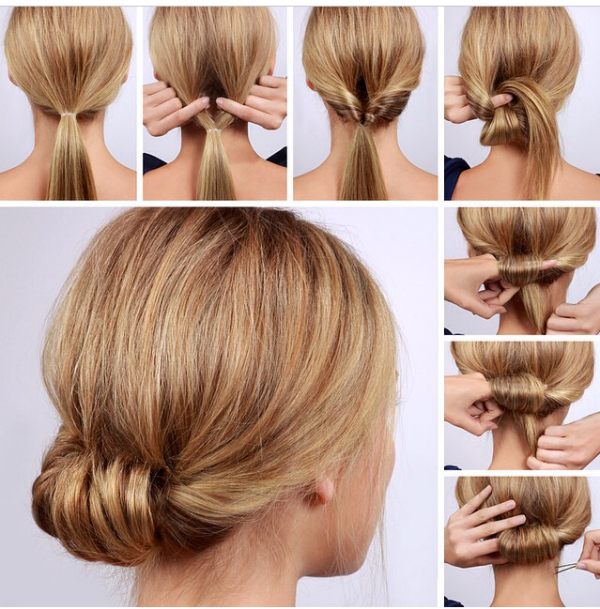 You will need 5-10 bobby pins to secure the stray ends in place. Don't forget to spritz a light layer of hairspray all throughout. Voila. It's party time people! 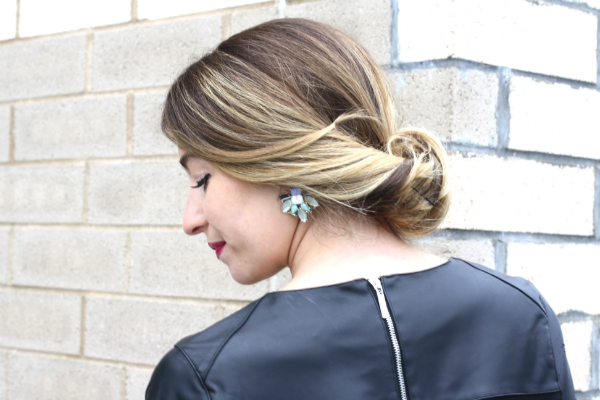 Scroll down below to see a quick and easy illustration on how to pull off this chic up-do. I hope this inspires you to get fancy with your hair this holiday season, and if you wear it out and about I want to see it! Tag me on instagram @jgalfo. After the long holiday weekend, it's back to the work grind. I hope you all enjoyed the family time and endless amounts of turkey and apple pies. It was so nice to be back at home in the suburbs. I almost didn't return to the city...almost. Over the weekend, I spent a decent amount of time deal-searching with my mom. We didn't participate in the Black Friday madness, but we DID go shopping on Saturday and we scored some wallet-friendly deals in every store. Who needs to shop on Black Friday when the specials last all weekend? It's a marathon, not a sprint people! During this time of year, it's important to shop for quality and worthwhile pieces. It's better to invest in these pieces now while all the sales are still going on. I typically look for items that are transitional. This time of year is extremely unpredictable. One minute there's six inches of snow on the ground, the next minute it's 65 degrees outside. As the temperature begins to steadily decline, you'll want to have these items in your closet: riding boots, ankle booties, oversized scarves, a parka, a blanket poncho, and a few fun knit sweaters. The open-back knit sweater featured above by Charlotte Russe is one of the newest additions to my closet. 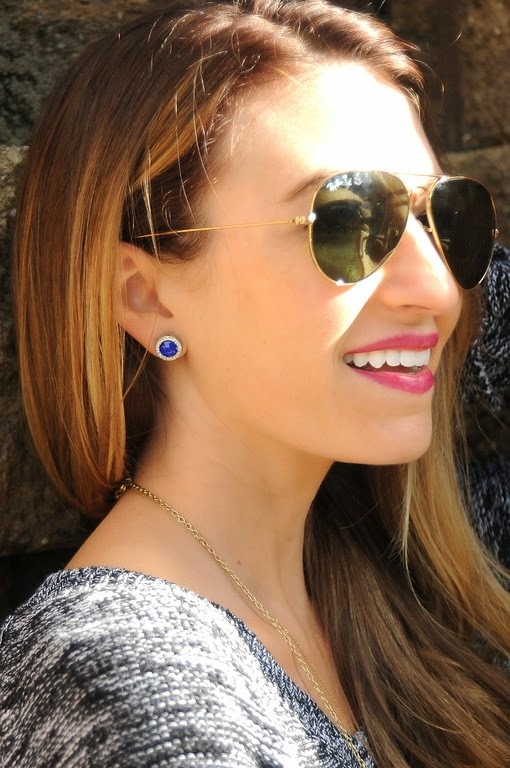 I'll be wearing it on repeat this season with a variation of statement necklaces and dainty jewelry- like these adorable sapphire stud earrings & long layering necklace from Pink Slate Boutique. Chunky knits are great investment pieces for your winter wardrobe because they add texture and create depth to any look. Plus, they pair strikingly well with ankle booties. Can we talk about how adorable these Kelly & Katie booties are from DSW? Can't wait to wear them to upcoming holiday parties! What items are topping your holiday list?